Serial expat Amanda Walkins is a freelance writer and blogger. She has lived in 7 different countries, traveled to many more, and loves helping people explore the world through slow travel and living overseas. In case you missed it, Part One in this series on how to move to Roatan was Finding Housing and Part Two was working abroad. I’m doing this series in an effort to answer a few of the more general types of questions I get via email, Facebook, and comments. Hope it helps! 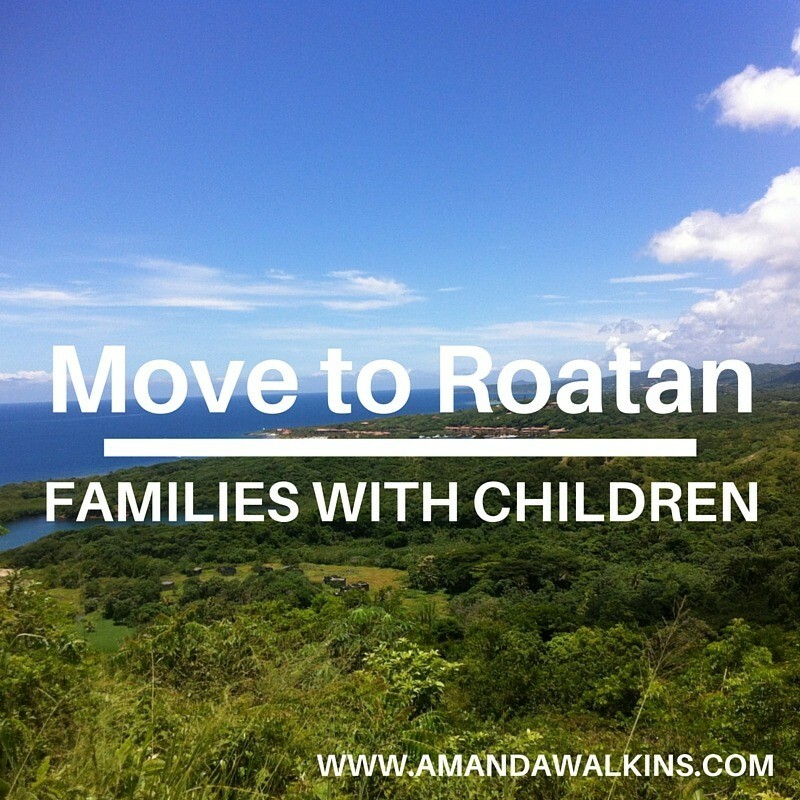 Here’s part three: Moving to Roatan with children. Some parents want to move abroad to offer their kids new experiences, especially with a different lifestyle focused less on materialism and more on appreciation. Yet there seems to be a bit of hesitation in moving to Roatan with little ones so I wanted to shed some light on what life is like here for expat kids – because there are lots of them! Clearly having none of my own doesn’t offer me the position to talk about myself and my experiences, so I’ll let one of my friends do the talking instead. Readers, meet Kirsty and Brian, and their awesome daughter Spencer Rose. Kirsty came to Roatan originally in 2002, where she happened to meet Brian on one of his leave weekends from the military. They dated but then went their separate ways. Brian continued deployments around the world and Kirsty worked in Hawaii at a dive center for several years. They kept in touch over the years and remained close friends, until eventually, they reconnected and decided to move back to Roatan together once Brian retired from the military. They got married in 2010, and along came Spencer Rose in 2011. “I spent most of my pregnancy in the U.S., where Brian was based before retiring. We had good health insurance, I went to all the right doctors, and then we moved to Honduras a few months before I was due. Most people gasp and think I was crazy, but it was incredible coming here. It felt like a welcoming community to bring a baby into (after all, they do it every day). The doctors treated us like family and made us feel the most comfortable we’d felt during my pregnancy. We had an emergency C-section that went off without a hitch and we only paid US$1,500 (without even tapping into our insurance) – much less than anything would cost back in the States. “I think a lot of people are concerned that they won’t have the same resources to raise a child here. They need to understand that it will be different, but that’s the point. If you’re considering raising your children in another country, it’s for a reason. Kids grow up here all the time – and there are benefits and drawbacks to living on an island just as there are benefits and drawbacks to living in certain towns or cities in the U.S.
“This is not a place for parents who are afraid of their kids getting hurt. Kids play outside (thankfully they aren’t stuck in front of TVs and video games). Kids get hurt here, they get dirty, they get bug bites, and they break bones. We don’t have the best facilities, but the doctors are used to kids falling out of trees. If it’s something more serious – just like you would do if you were living in a more remote area of the States – you would move your family in order to access the very best facilities available. It’s the same situation here. But for all normal kid injuries and illnesses, we are covered. I have doctors’ cell phone numbers and they answer every time I call. There are pediatricians at local clinics and at the island hospital, as well as specialists who travel here regularly from the mainland. For normal kid problems, we have resources available. Miss Spencer Rose has always been a water baby! “Parents often worry about the food here. Kids can be picky! But I’ve never had an issue accessing what I need, and Spencer’s diet is much better here than it is when we visit the States. We have fresh fruit galore here. My child’s first foods were fresh avocados and mangoes and bananas we picked straight from the trees around our house. Gerber is available in the supermarkets, but it is more expensive because it’s imported. Availability of items continues getting better, but if you’re finicky about brand names or organic labels, you’ll find yourself very limited. It is so easy to keep Spencer away from fast foods and sodas here though. She’s not being marketed at constantly, and her school doesn’t even allow sugary treats. I feel like it’s a much healthier way to raise her. “We send Spencer, who is 3 years old, to a Montessori school called Discovery Bay, where she will continue for the next several years. Most expats don’t consider the public schools here a valid option (the national education system is desperately lacking in funding and leadership). There are several choices for private school here (FYI, vaccinations are required to enroll in most schools here) – and lots of expats supplement schooling with homeschooling or 100% homeschool. You find this even more with the older kids (high school years). There is not much concern with homeschooled kids missing out on social activities as most events, gatherings, and extra-curricular activities are not connected with the schools, allowing all the kids to interact no matter where they are being taught. “I want Spencer to have choices: university, travel, whatever it may be. The Montessori school here has been wonderful; she is more advanced than many of the kids she met in the States. However, things can change so quickly on an island – people come and go all the time – so we’ll see where the programs are at when she’s getting into higher education. We are open to different options, including possibly going to the U.S. for those years. You really have to be flexible living on a small island. “I feel safer with my child here; I don’t worry so much about strangers. It is very kid-centric here – a combination of the Latin culture and living on a small island. Everybody watches out for everyone’s kids; everybody has a role in raising her. You create a new family if you’re far from your own. Grandparents who miss their grandchildren back home become her other grandparents. Our friends are her aunts and uncles. Spencer is surrounded by people who consider her to be part of their family. We have a tight network of other families with kids here, too, so she always has someone to play with. Her friends are kids of all ages, they’re adults, they’re other expats from around the world and they’re locals. They are even the local dogs, cats, birds and iguanas! “I believe cultural education is important to Spencer’s growth. We don’t have museums and theater here but she gets a different kind of cultural education every single day. She learns Spanish, Italian, and German from her friends while also getting a bilingual education at school. She gets to share in their traditions as well as local island traditions. She is outside all the time. She’s not afraid of much – she loves tarantulas and bats and all variety of bugs. She sits on the dock and points out the different fish and the occasional octopus. She sees the beauty in our sunsets. First of all, I’d like to thank Kirsty for being such a good sport and providing so much info! Secondly, if her words aren’t a ringing endorsement for raising your child wherever and however you deem fit, then I don’t know what is. You can find the good and the bad anywhere you go. What expats seem to do better than anybody else is to seek out the good and focus on it, rather than hiding from the bad.